Lodging in Bardstown, Kentucky ranges from a former jail to a 1960s era motel that evokes memories of childhood road trips. Since the room that I wanted in the former jail was booked this past weekend, I opted for a one night stay in the 1960s era motel overlooking My Old Kentucky Home State Park. I’m glad I did. 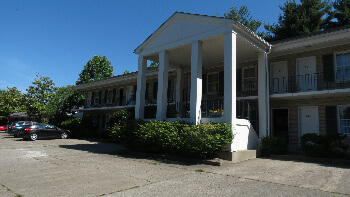 Bardstown Parkview Motel, opened in the early 1960s, is operated by the same family that first opened it to travelers motoring along state roads taking in sites about Abraham Lincoln, Stephen Foster, the Civil War, and bourbon. Those were the days when families piled into station wagons with wood on the side, and when a dip in a hotel pool was a welcome reprieve from summer heat. These days, travelers swap tales in the Bardstown Parkview Motel’s breakfast room. Over a donut, orange juice and a cup of coffee, one conversation was with the parents of two members of the Bluegrass group, Kentucky Bluebelles. The Kentucky Bluebelles, all women, were in town to perform at the Bardstown Bluegrass Festival. The mom said what I had been thinking about Bardstown Parkview Motel’s appeal. “It reminds me of when I visited here as a child. The look is the same. Even the sidewalks. I love it,” she said. Although Bardstown Parkview Motel evokes feelings of a childhood road trip, there are updates. Paint is fresh. Furniture is new. TVs are flat screen and there is free WiFi. Bathrooms have been updated as well. The swimming pool has crystal clear water and plenty of chairs for lounging. Another bonus of the Bardstown Parkview Motel is Kurtz Restaurant that shares a parking lot. Owned and operated by the same family that owns the motel, Kurtz Restaurant is a local favorite known for southern specialties like skillet-fried chicken, roast turkey and biscuit pudding with bourbon sauce. The restaurant has been in operation since 1937. For our needs, the Bardstown Parkview Motel was perfect. I wanted a clean, comfortable place where my daughter could get a good night sleep before I dropped her off at Ft. Knox 45 minutes away for a summer of ROTC training. The price was also right-$79 for two with our AAA discount. Each of us had our own queen-size bed. An advantage of this hotel is that the swimming pool is close to all rooms so that a dip in the pool is an easy outing with kids. The pool is also tucked in the back for privacy and R & R.
About the jail. 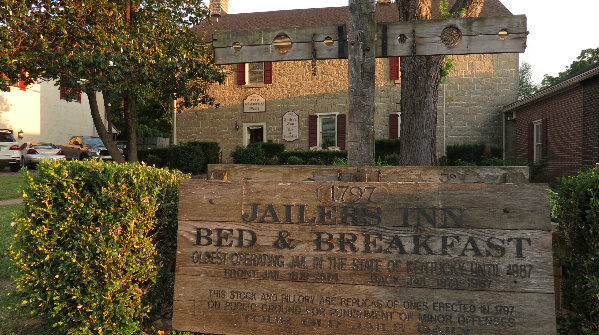 Jailer’s Inn Bed and Breakfast, is housed in a former jail that was built in 1819 and is on the National List of Historic Places. Prior to 1819, the Old Nelson County Jail was located here as far back as 1797. The building operated as a jail until 1987 and was the oldest jail complex in Kentucky. The transformation from jail to B & B is stunning. Each room is appointed with antique furniture and decorating details of elegance and charm. Other room rates range from $145 to $235. Weekdays cost $10 less. All rooms have a private bath and a TV. A full breakfast is included. 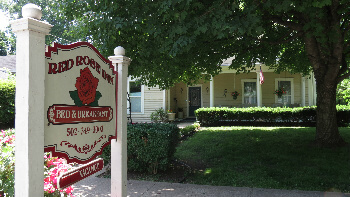 If a charming B&B is more your style, try Red Rose Inn, also on Stephen Foster Avenue near the edge of downtown. 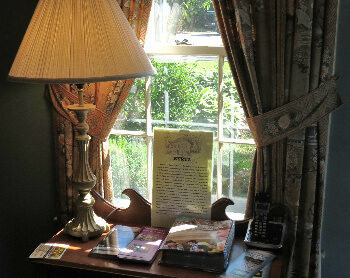 Built in 1820, the lovely four guest room inn is on the National Register of Historic Places. Each room of this Victorian era house has a private bath and cable TV, and three of the four rooms have a fireplace. The hot tub/spa is open year round. A gourmet breakfast is included. Homemade cookies are served daily. Room rates are $135-$145. 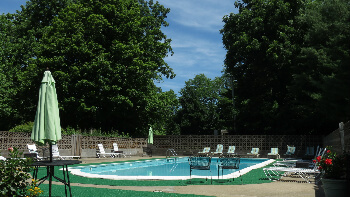 Search for these and other Bardstown, KY hotels at Trivago.com. Post and photos courtesy of Jamie Rhein, member of Midwest Travel Writers Association. Say the word “trip” and Jamie Rhein is packed. Rhein has traveled to 35 countries (lived in five of them) and has been to every state but Alaska and Rhode Island. A freelance writer and educator, currently living in Ohio, Rhein has written numerous travel articles for print and online publications on everything from white water rafting to the best hot dog worth driving to. Publications include Ohio Magazine, Country Living, Hocking Hills Visitors Guide, AOL’s online travel guide to Cleveland and Cincinnati, and the travel blogs Gadling and Uptake. One of these days, she’ll really focus on that blog of hers—Hither and Yon. The problem is she keeps heading yon–as in yonder. Hotel-Scoop.com is a travel resource site with detailed accommodation reviews of lodging worth talking about, from professional globetrotting travel writers. Check in each weekday to see a new review of an interesting hotel, resort, bed and breakfast, or inn - with occasional hotel chatter about hospitality industry trends.. - All Rights Reserved.